NWFR April Grand Report Drawing! How Strong Is Your Favorite Knot? For most anglers, winter and perch fishing means sitting next to a 6” hole in the ice, bundled up in seven layers of clothing, periodically clearing away ice from the hole and your rod tip. That’s the Washington’s eastside version of perch fishing, but on the west side we have an entirely different game. 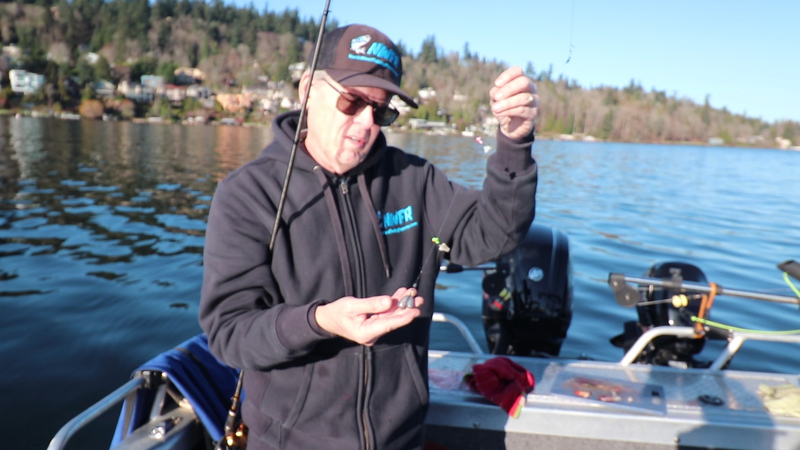 The Cascade mountain range gives westside anglers both a blessing and a curse – four months of steady rain and clouds dampen the spirit of people in the greater Puget Sound region – but we tend to avoid those cold temperatures that turn soft water to hard. While most anglers are off in pursuit of ever dwindling steelhead runs and short blackmouth seasons, there are lesser known fisheries that offer westside winter anglers opportunities to get out and wet a line – and catch a lot of fish in the process. One of those oft over-looked winter fisheries is for the prodigious yellow perch. Most lakes in Washington have populations of perch and usually in big numbers. 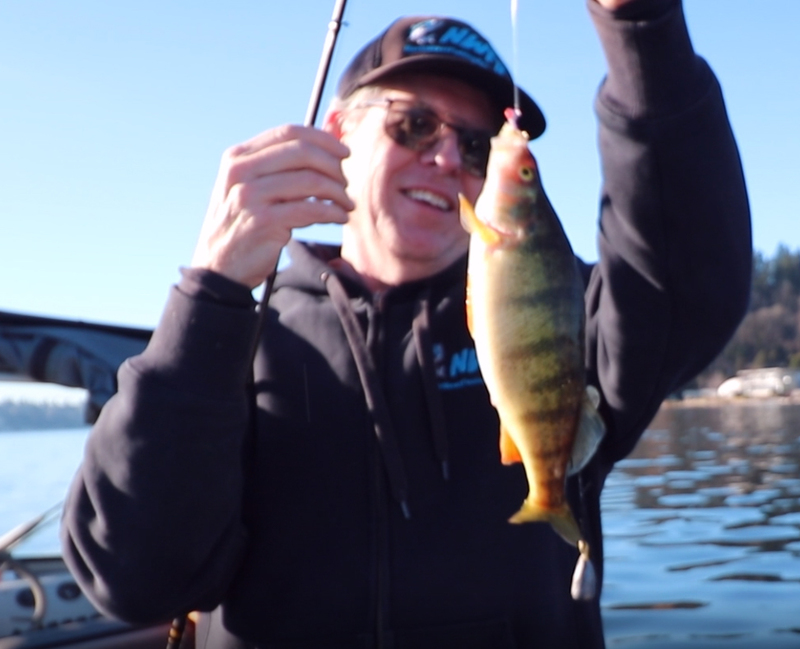 Danny Garrett of WDFW notes in a recent WDFW perch video, that most lakes have a robust population of perch and are indeed an under-utilized resource. 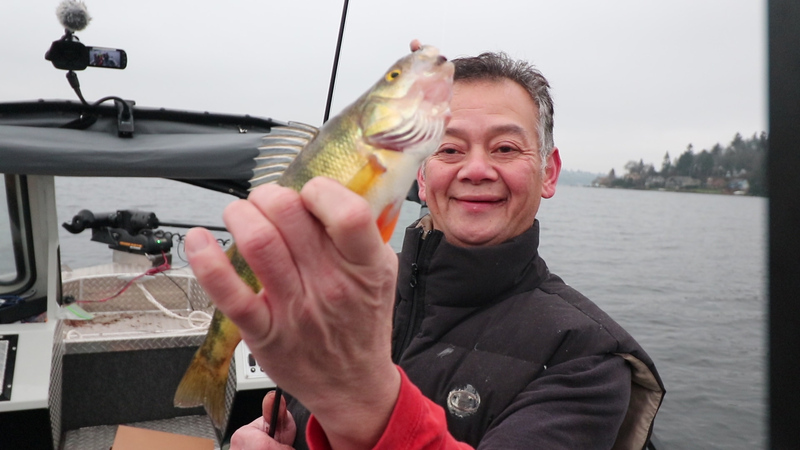 A biological assessment of Lake Washington by WDFW indicated “Yellow Perch Perca flavescens was the most abundant warmwater gamefish species sampled and comprised 19% of the sampled biomass; second to Largescale Suckers (35.3%)”. Lake Washington is 22,000 acres in size which means there are a lot of places to search for these perch. Unlike summer perch that hang in the edges of the lakes weedline, in the winter perch tend to migrate to the deeper parts of the lake. Thus, it presents different challenges, and opportunities, from summer perch fishing. When approaching a lake for winter perch fishing, what determines a good place to start? Well, if you have a bathometric map that will give you a good beginning. Look for drop-offs and deep holes. Don’t be afraid to prospect deep waters for perch. On Lake Washington, I’ve had good success in the channel that runs mid-lake for the Seahawks facility and south of Mercer Island. There’s a nice area that drops from 70 feet down to 100 feet. I’ve found good numbers of 10-11” perch here. Those are the ones you’re looking for. But consider a larger lake like Washington is going to have multiple places to find fish so don’t get stuck on one particular location just because that’s where you see all the reports coming from. Perch “tend” to group themselves in size classes so if you’re catching nothing but 5-6 inch fish it’s time to move! When you find the fish you want to keep make note on your GPS. I always drift with my breadcrumbs (trail) on so I can run back to the “top of the drift” and hit the same groups of fish multiple times. A big part of winter perch fishing is boat control. Because you’ll be fishing deeper, windy days can be tough. But so, too, can calm days. Why, you ask? Think of it like this – if the day is calm and your boat is drifting at .1-.2 mph, you are not covering much ground. If you stop over a nice cluster of fish, that’s great. But if you stopped over a barren part of the lake you’ll end your day wondering why you don’t have a picture of a bucket load of fish when others do. It’s important, I think, to be on the move. On calm days I’ll use my electric trolling motor to keep me slowly moving along. I like a speed of .4-.6mph. At this rate you cover enough territory to find fish but aren’t moving so fast that you can’t keep in contact with the bottom. Now, if by chance you find a large school you may want to anchor up and work the school. If you have an electric trolling motor that has an anchor feature you can hit the anchor button and stay right on the school. In my experience, covering some ground is a better plan of attack. But your results may be different. Find whichever method you prefer and become an expert at it! As alluded to earlier, keeping contact with the bottom is the single most important factor when it comes to winter perch fishing. These fish are sitting literally on the bottom looking up. They aren’t actively schooled in clusters of fish that span 10-20 feet wide. They are sitting in the gravel. So if you’re off the bottom you are just not going to have as much luck. You should be constantly making contact with the bottom. Because of this, I prefer a baitcaster reel to a spinning reel. It makes it easier to drop back line as needed when checking in with the bottom. As to how much weight you should be using…enough to stay in contact with the bottom! If we are drifting along at .6 mph I may have a two ounce dropper weight if we’re fishing 70-100 feet deep. I’m also using a reel spooled with braid and a fast action rod. This is totally different from summer or fall perch fishing when you’re in 10-20 feet of water. In winter you need rod sensitivity to feel the bottom when you’re fishing deep. OK, we’ve discussed the strategical aspects of winter perch fishing, what about the tactical part? What do you drop down to your targeted adversary? Fortunately, like summer and fall perch, winter perch are not very picky. They will eat worms, and chunks of shrimp, plastic scented baits, etc, etc. 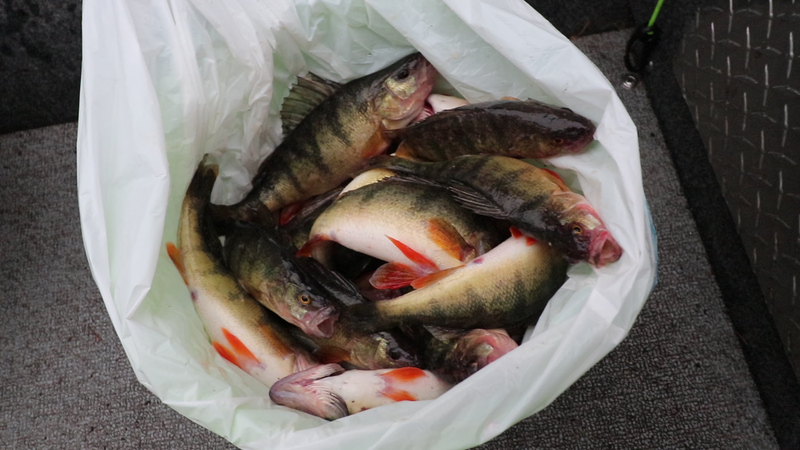 That said, the number one go to bait for perch is in my opinion – perch! Once you catch that first perch you are literally set for the day as far as bait is concerned. Perch are cannibals. They absolutely will strike a small piece of perch meat on your hook over and over again. What’s even better, perch meat, with the skin on, is incredibly durable. You can literally catch one fish after another with the same small chunk of perch meat. If you’re using a number 6 hook (you should be because perch have small mouths) a small piece of perch meat with the skin on, say, 3/4“by 1/2” will get you plenty of fish before you need to cut another piece. It’s that easy. For rigging, I’ll tie up a drop shoot rig with two hooks about 6-8” apart and the weight 6” below the bottom hook. Drag this rig along the bottom. Do NOT make big jigging movements. Make gentle, 4-6 inch drop backs, keeping contact with the bottom. Depending on how aggressive the perch are feeling you may get a solid take or a peck peck. The peck peck days are the most challenging because you’ll need to give a little hook set while the fish is pecking at your bait. No need to give a big hook set – a simple quick yang of your rod 6-8 inches will be enough to set the hook. If you miss the fish, just make contact with the bottom. That fish will likely still be there. Once on, keep the pressure on, reeling constantly and hoist your fish into the boat. Of course, check the regs for the body of water you’re fishing as to whether you can use one or two hooks. The hooks can be tiny weighted jigs or bare number 6 hooks. It really doesn’t matter much. I’ve seen plenty of comments when anglers post a picture of a pile of perch about what a pain it must be to filet all those fish. A word of advice that made a big difference for me was to invest in an electric filet knife. The time and ease of filleting with an electric knife verses a single manual blade is like night and day. It’s worth every penny and will help you to quickly process all those perch you’re going to catch! I would also be remiss if I didn’t mention that perch in some lakes can build up toxins and heavy metals. You’ll want to pay attention to any special advisories on the lake you’re fishing. Lake Washington, for example, has a recommendation of eating one meal of perch per week for adults, and none for pregnant women. That said, perch are a delicious white-fleshed fish that lends itself well to deep or pan frying. You’ll enjoy getting on the water to catch them, and eating them when you get home!